From promoting your favorite candidate to tell people to keep off the grass, yard signs are a great way to get your message out. Also they are great if you have a place for rent or sale. Think about all the bikes, cars and pedestrians that pass buy your lawn. Your yard could be a great advertising spot. 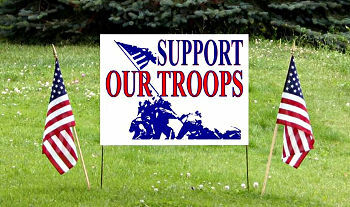 We make signs that are durable and will catch the attention of people passing by. Our graphics designers will work with you to design the perfect yard sign for your business or organization. Give us a call or come by our shop to talk about all the printed marketing materials that you need.